Today’s business landscape is very competitive. At the forefront of that competition are sales organizations–day in and out fighting to add to their companies’ bottom lines. It takes a great sales team to win, yes. However, it takes much more than that. Enter sales acceleration. It’s already been more than a decade since customer relationship management software–or simply CRM–opened the floodgates of tech solutions that help sales teams win more and win fast. 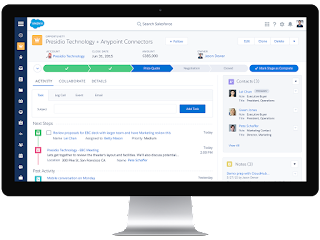 Salesforce emerged as the leading CRM, used by 150,000 organizations today. A way to optimize your CRM is to integrate it with your phone system through computer-telephony integration (CTI). Here are five salient benefits of Salesforce CTI Integration. A part of integrating Salesforce with your phone system is a dialer. A Salesforce dialer that enables click to call eliminates the need for manual dialing in your system when you get a lead in Salesforce. Dialing out manually takes precious seconds. It could be cumbersome as well, depending on your workflow. With a click-to-call function, contact numbers in your CRM and even on the pages in your browser turn into clickable links. Your team can initiate a call just by clicking the number. These precious seconds you save can spell the difference between a spoiled lead and a successful connection. Prospects won’t always pick up the phone the first time you call. It’s normal for your reps’ calls to go to voicemail. Salesforce CTI integration optimizes calls so your reps only connect with numbers with a live person picking up. Another feature that improves your chances of connecting with a live person is the ability to call with a local phone number. Most of the time, prospects would be doubtful picking up if a phone number from another state shows up on their caller IDs. This CTI function called Local Presence allows reps to use a phone number from the same region of the prospect you’re calling. Any sales acceleration solution will promise more sales. For Salesforce CTI, the reasoning is simple. Reps get to record all call data, and they’ll have the same data available to them real-time when a call comes in or when they dial out. Even if another rep talked with a particular prospect, they’ll benefit from another rep’s logged info from another call. This helps teams convert more sales opportunities. Prospects will feel more valuable when they speak with a rep who knows how to deliver what they need, in a more personal way. Since Salesforce CTI integration makes their work easier, reps increase the usage of their CRM. A higher adoption rate isn’t only beneficial because of the way they make a rep’s life easier. It also gives management a detailed view of all sales activity. When reps use their phones through the CTI, all their activities are logged, recorded, and tracked. Higher CRM adoption rates make it easier for sales managers to identify opportunities for coaching, training, and other points that help the team and the whole organization improve their process. Managers can make the best use of Salesforce dashboards to review all tracked key performance indicators (KPIs). These KPIs include average call duration, opportunities created, calls made, and more. This helps management measure both individual and team performance. It also helps sales managers pinpoint milestones that need to be celebrated and commended.